Ah, behind that clock tower. 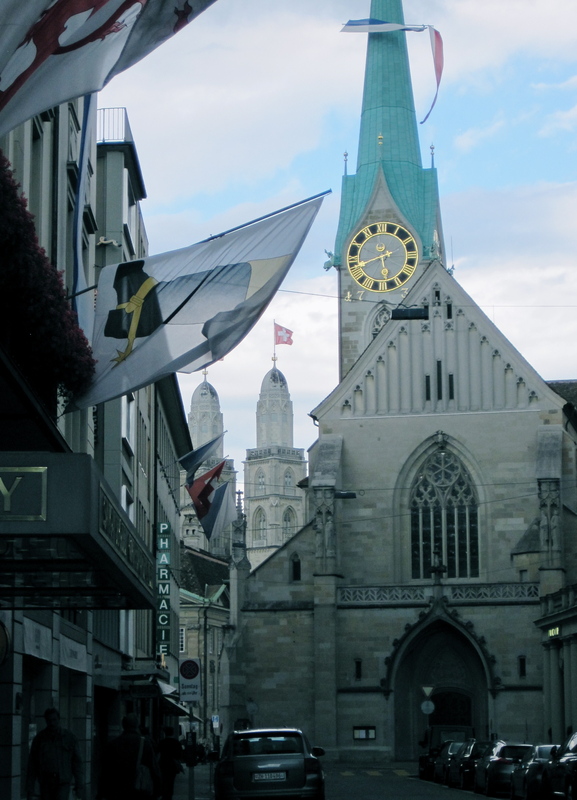 Zurich is pretty cool. I’m working under the care of the James Joyce Foundation, a private organization that is hosting a workshop on Joyce and food next week. We prepared by eating the entire day. Two people brought pastries, and we supped on quiche, salad with both grated and sliced cheese (! ), chocolates, and plenty of coffee. On days like this I love my job. I’m in London, en route to Zurich, eating a full English breakfast minus the fatty bacon, burnt sausage, watery black tomato, and Heinz beans (i.e., poached eggs on toast). Cherish your cage-free eggs, mates, because the alternative is tasteless. Worse yet because I’ve spent the last week reading up on Victorian food adulterations. Ick. ps. Luggage is with me this time. United is way better than Delta, but I’ve lost my innocence. pps. 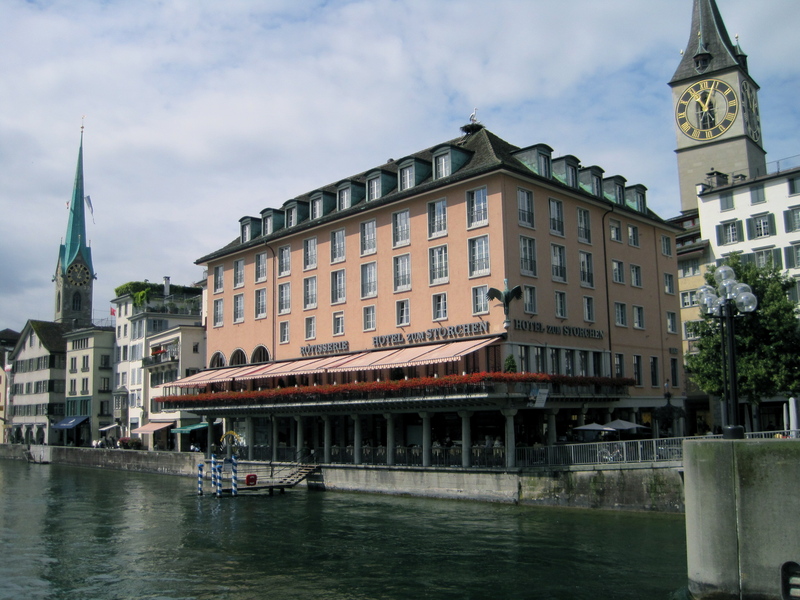 If the food in Zurich is anything near as good as I think it will be, we’re in for a wild, cheesy ride. iron chef eugene winner: chef gabriel gil! Due to unforeseen technical difficulties, the entire competition got started a couple of hours late. Chef Adam Bernstein of Adam’s Sustainable Table battled and won against his competitor, Chef Scott Whitus of Café Zenon. Gabe took on Chef Max Schwartz at Café Lucky Noodle…and reigned supreme. 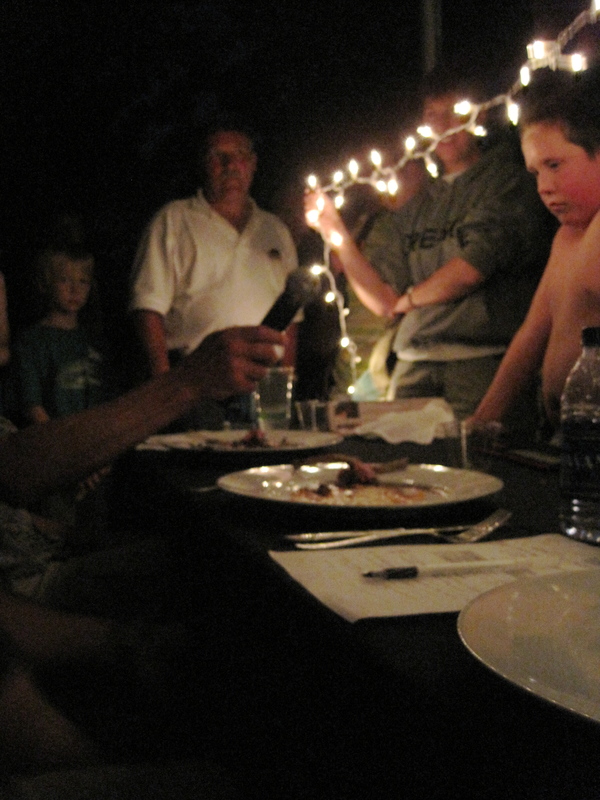 By the end of the finals, it was pretty dark and the chefs could barely see. Staff rustled up some lights for the stage and some charming Christmas lights for the judges’ table. Unfortunately, a half-naked kid stood right in front of the table as we judged the dishes. Rather unappetizing, sorry. But I did like the mood lighting. Just as in the original Iron Chef competitions, the chefs had a secret ingredient: goat cheese. 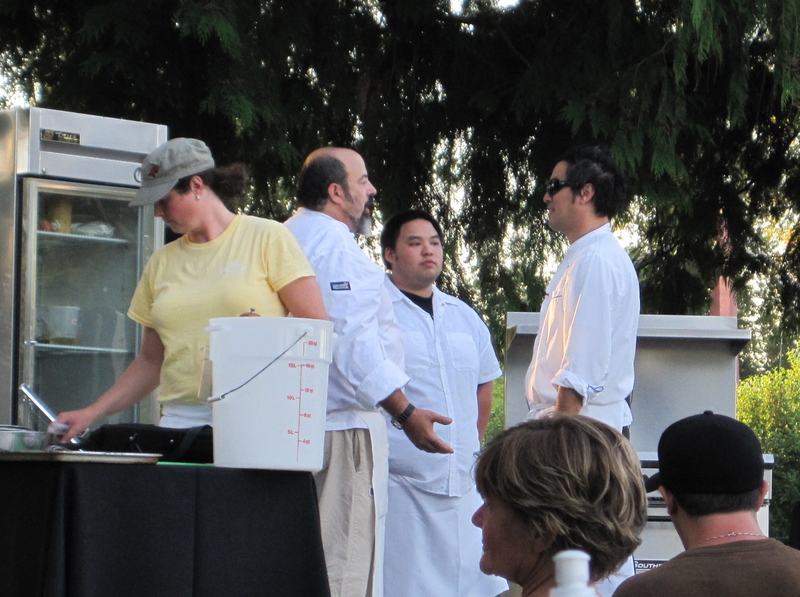 The task was to integrate the ingredient into several dishes in 60 minutes as Steve, the emcee and festival organizer, chatted with the audience. Then, the judges gobbled down as much of each dish as they could and tallied the results! 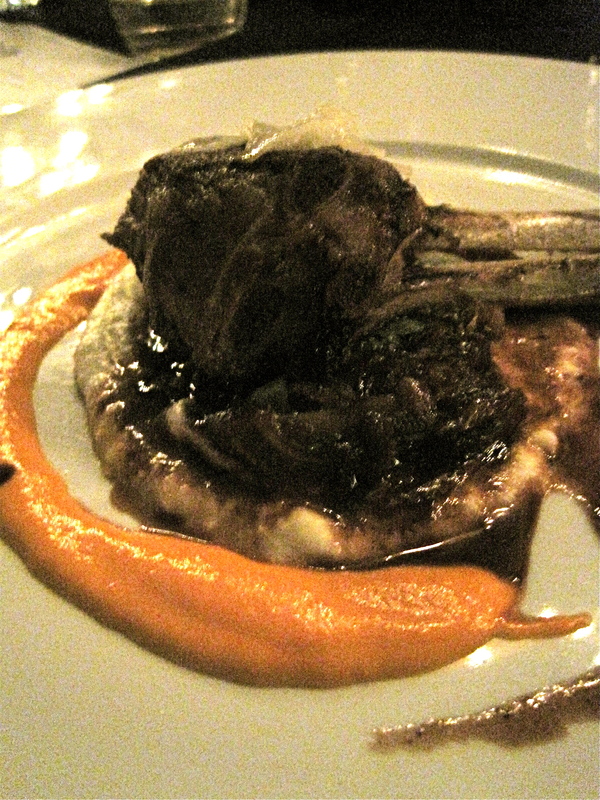 Two of my favorite dishes: Gabe’s lamb “lollipops” with goat cheese pudding and sweet pepper purée. The lamb was sauced with a fennel and port reduction, and garnished with shaved aged goat cheese. 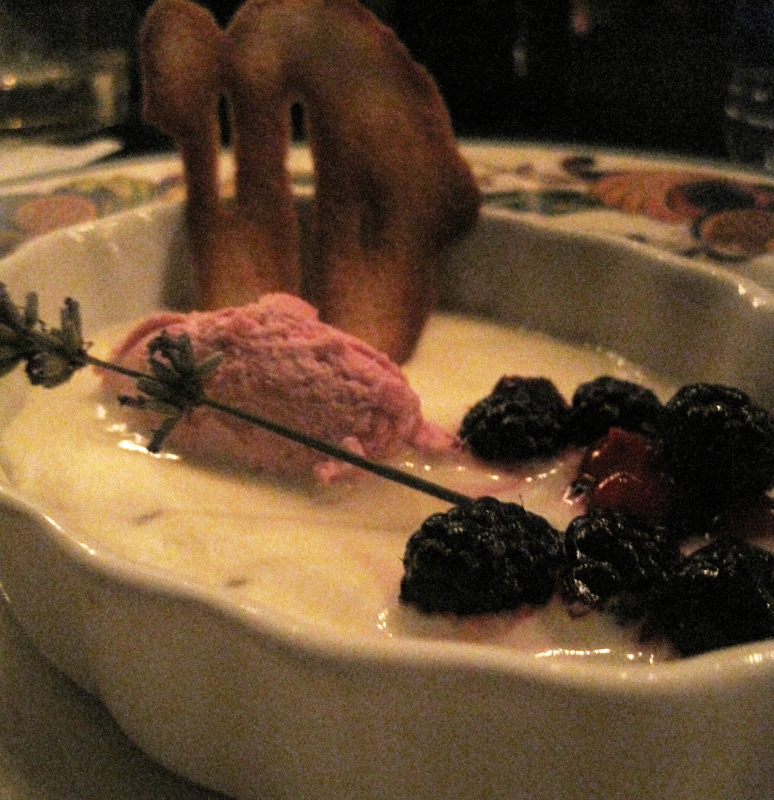 The second photo is of Adam’s melted lavender goat cheese ice cream with berries and a black pepper tuile…”it’s become a crème anglaise!” he said. (The delays meant that both of the chefs’ desserts didn’t take properly, and I didn’t critique “acts of god” in the judging.) I’m a big fan of sabayon and similar sauces with berries, and really liked the combination of berry-pink, slightly sour goat cheese crottin, beautifully and saucily enhanced blackcap raspberries and currants, and the crème. I didn’t get a shot of another favorite: Gabe’s dessert, a slightly droopy (again, technical difficulties) goat cheese panna cotta with a cilantro purée, a very light caramel sauce, orange segments, and strawberry Pop Rocks. Yep, you heard it correctly. And I was heard saying for the first and last time ever in public that I wanted even more Pop Rocks! Gabe also pulled off a stunning salmon belly roulade on a salad of vinaigrette-dressed tomatoes and watermelon cubes. I have to say that he didn’t make much of the goat cheese on this dish (I think it was under the beautifully acidic tom-wat salad?) and that’s not a good thing in Iron Chef competitions, but as a food lover, I have to say that it was an inspired combination. The fat in the succulent salmon roll and the meaty flesh of the fruit and the acid in the dressing, plus a few herbal leaves from the garnish, made me roll my eyes back in my head in joy. THAT GOOD! I hope this one ends up on the menu. Sorry about the dreadful photos in the dark. Here’s a cute one! 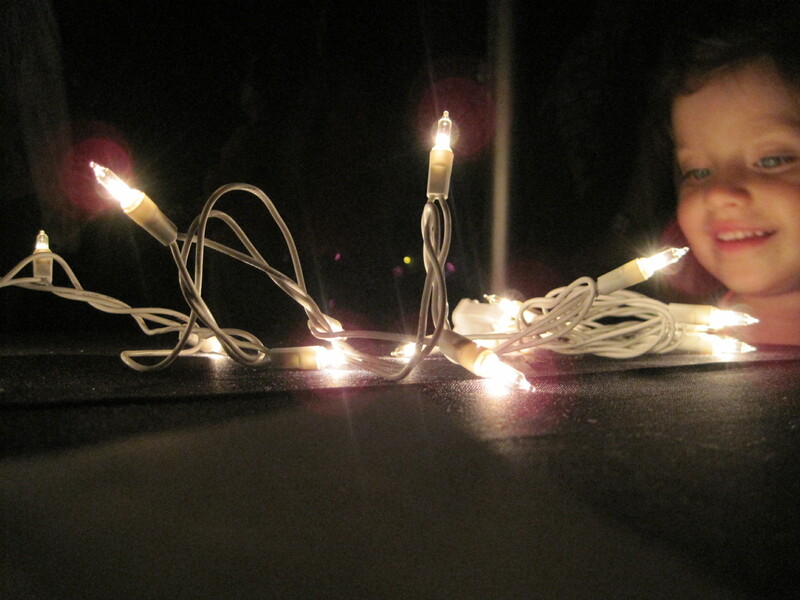 The daughter of my personable fellow judge, King Estate winery’s head winemaker Jeff Kandarian, watches little moths flit around the Christmas lights. I had so much fun at the competition, and thanks to everyone who stayed until the bitter end. Adam and Gabe both showed off their best for the competition, and I was so pleased to taste the results. They’re very different chefs. Adam aims for simple, more conservative, nearly 100% local fare (some of it from his garden, even). His aesthetic would be at home at an upscale hotel restaurant or a place where well-heeled businessmen conscious of their food delight in his creations. Gabe is more of a young Turk, experimental and whimsical. His molecular gastronomy and odd flavor combinations are unlike anything else we have in Eugene. Both chefs make me think there are changes afoot in the Eugene dining scene, and that things are getting better all the time. So now that I’ve been a judge, do I dare to ask to emcee next year? Could I really fill those brocaded, 18th century Kitchen Stadium shoes? It would be the pinnacle of my life’s ambition! I’ll see what I can do. Stay tuned…and ALLEZ CUISINE! 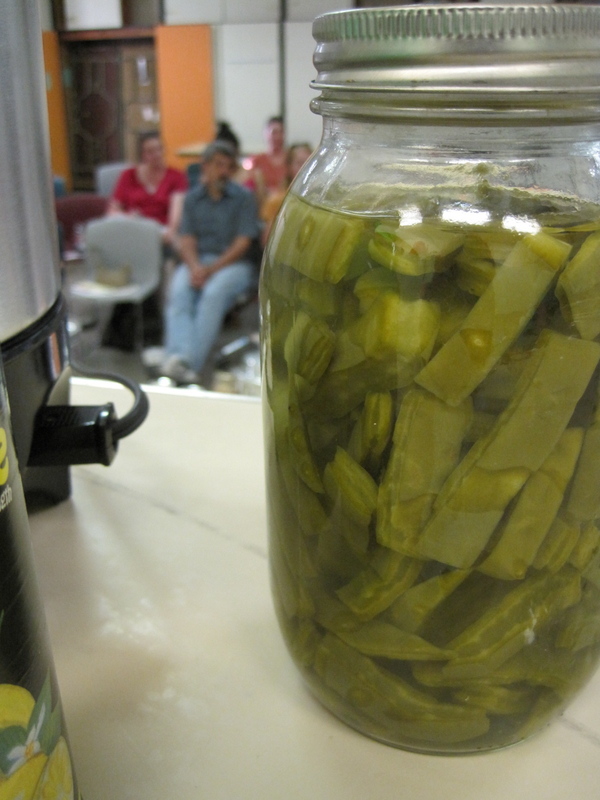 This weekend is Can-A-Rama, a grass roots educational event to teach canning in kitchens across America created by the collective preservation blog Canning Across America. Join in! Those raspberries aren’t going to jam themselves, you know. 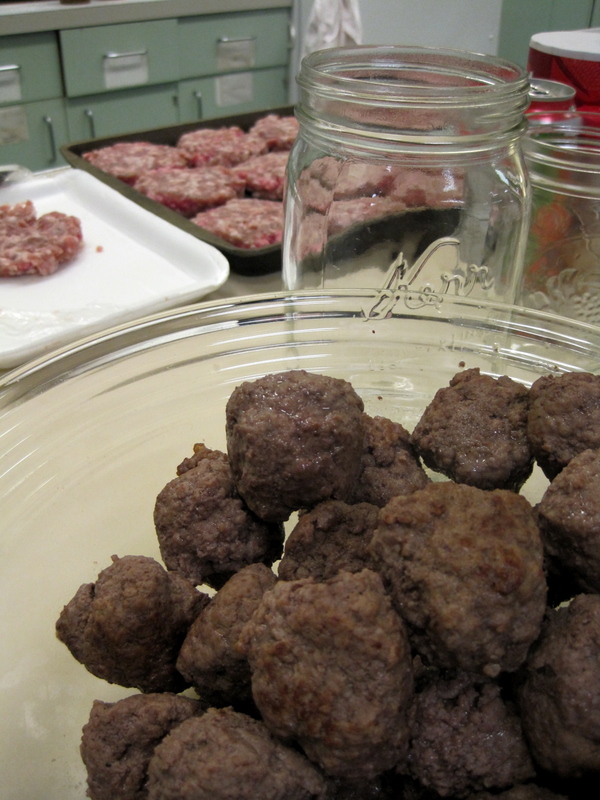 And your meatballs are waiting patiently. 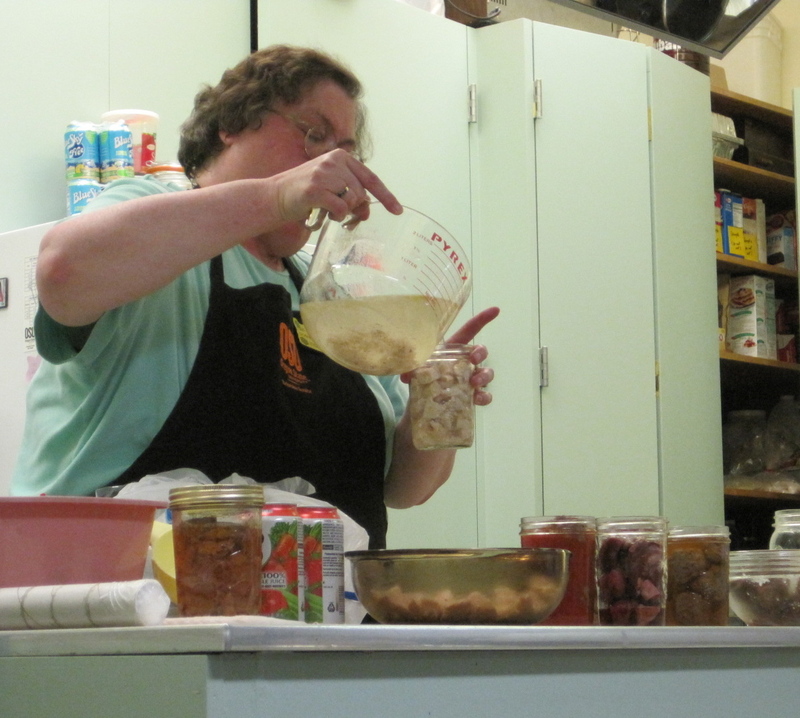 I did my canning last night at a pressure canning class, one of the last offered by the Lane County Extension Master Food Preservers before the program ends on September 2. 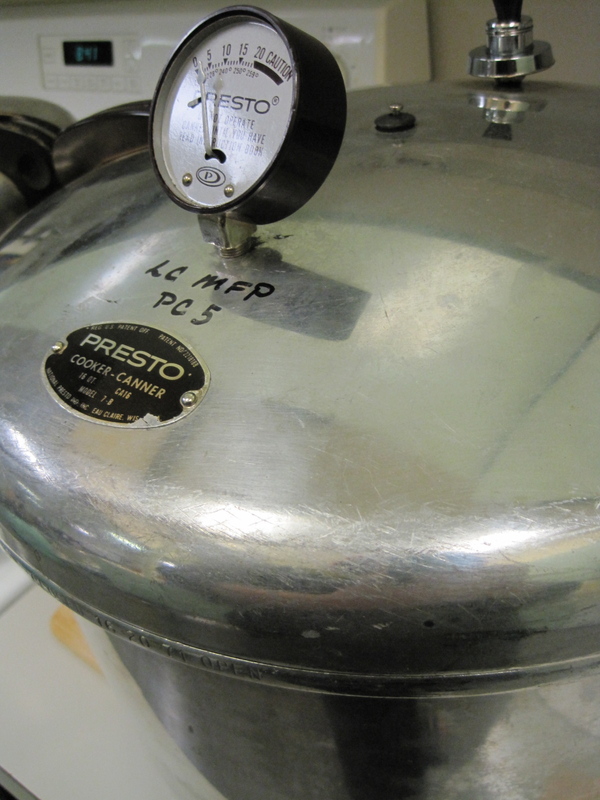 The action shot above is a pressure canner pressurizing (see the jiggling weight on the side of the canner?). Oh yeah. Work it baby! The class was packed full of appreciative community members, and it was heartwarming to feel the love. And there they are, viewed through my nopales lens from the stage at Extension. 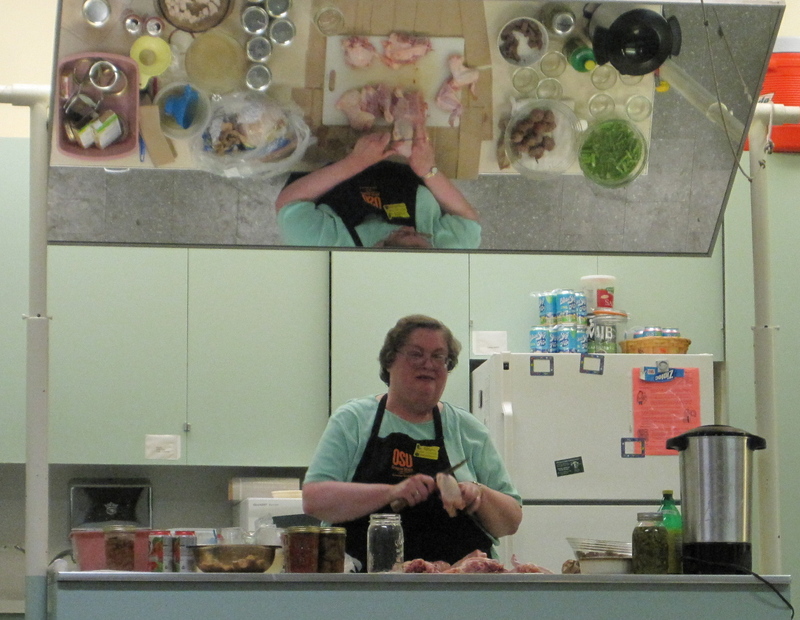 I don’t pressure can frequently, but I can (and did) teach the basics, so I think I learned as much as anyone else from the veteran canners who showed us how to can things like the aforementioned nopales, chicken on the bone, and meatballs. Watching Donna Crosiar bone a chicken, by the way, is one of the beautiful things in life. 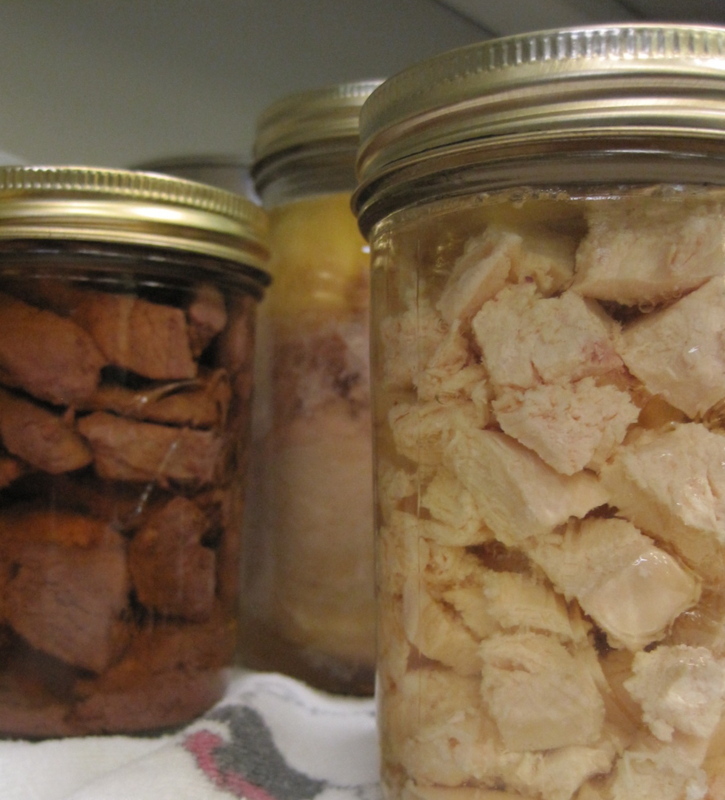 Pressure canning is kind of miraculous. I call it “How To Can Anything.” Because seriously, you can stick just about anything in a jar and pressure can it. 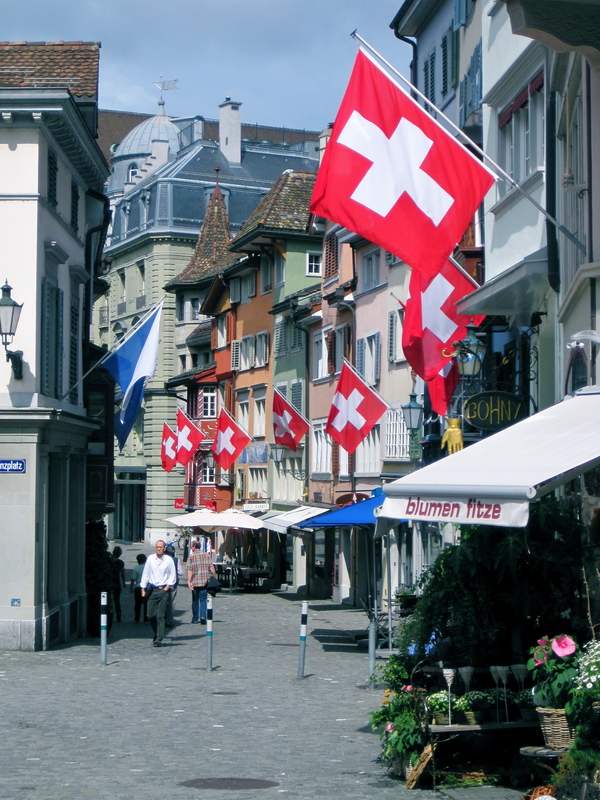 You could even can grass roots. 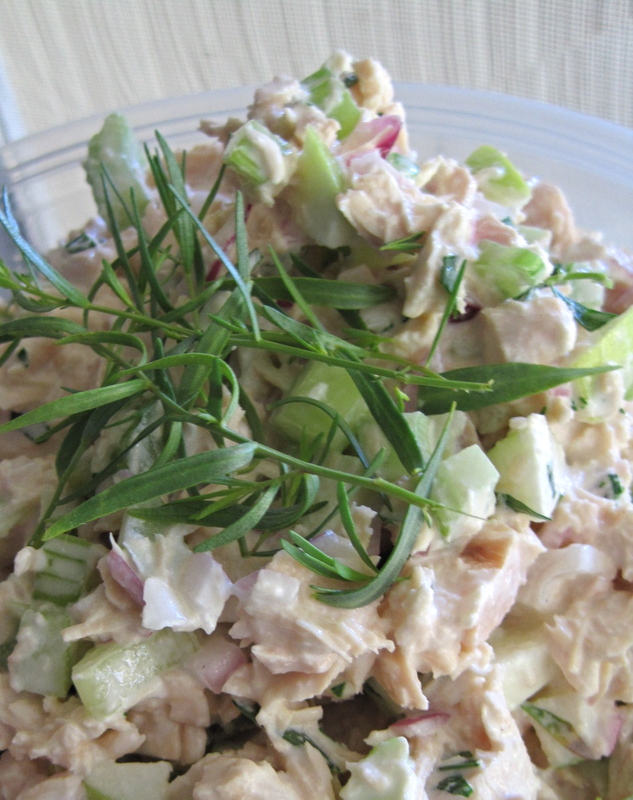 Mmm, tarragon chicken salad with green apple and celery. I’ll post more about canning nopales later, but I’m bound and determined to get stuff done today before heading off to our other grassy food event this weekend, Bite of Eugene. It’s a park festival down by the river at Alton Baker that features delectable bites from local chefs, all for the benefit of a fantastic nonprofit organization, Willamette Food and Farm Coalition. WFFC works to rebuild our local food shed, educating consumers about the farm and other food production networks we have here in the South Valley. It’s utterly worth supporting their mission by buying tasting bites. Win-win. A vegan friend of mine visited from the Bay Area last weekend. Up for a challenge, I decided to go undercover as a fellow vegan, vegging out on vegetables, while she was here. So, we did some cooking. Many of the side dishes I make are vegan, and it was easy to make a pot of beans, Moroccan carrot purée, some French olive-oil-based potato salad, panzanella, and dried fruit, berries, and hazelnuts for snacks. 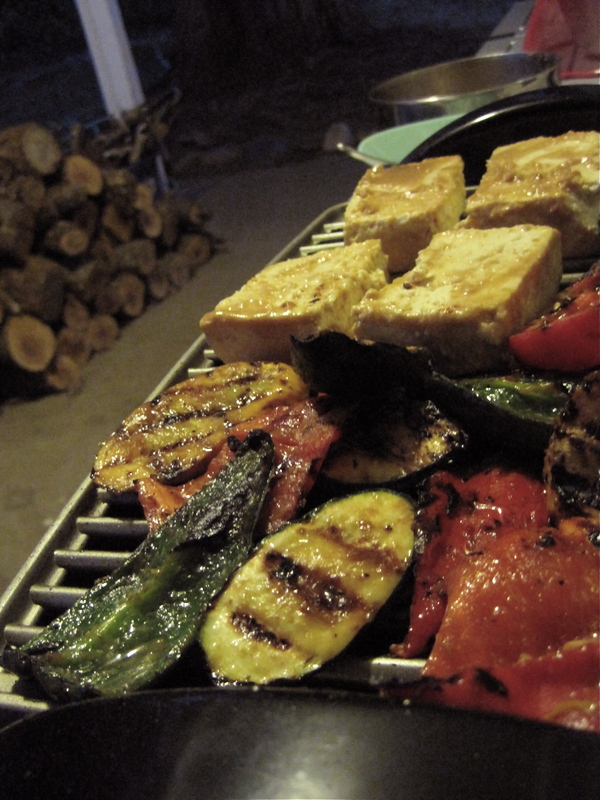 I broke out the table grill and made rather yummy miso-marinated grilled tofu and vegetables, too. To prepare vegetables: Slice vegetables in large pieces for the most attractive presentation. Zucchini and yellow summer squash work very well, as would small Japanese eggplants, sliced lengthwise twice, peppers, and sweet onion. (In our dinner, we used a red pepper, an Anaheim pepper, three small zucchini, and a summer squash.) Brush half of the marinade on the vegetables. To prepare tofu: For best results, drain water from a cake of firm tofu by placing it in a colander with a plate on top of it. Place a weight (like a big can of tomatoes) on the plate. Let sit and drain for 30 minutes or so. Dab any remaining liquid off with a paper towel. Then slice the tofu lengthwise in 1-inch thick slices. Brush the other half of the marinade on tofu. Marinate vegetables and tofu in separate bowls for about 30 minutes. 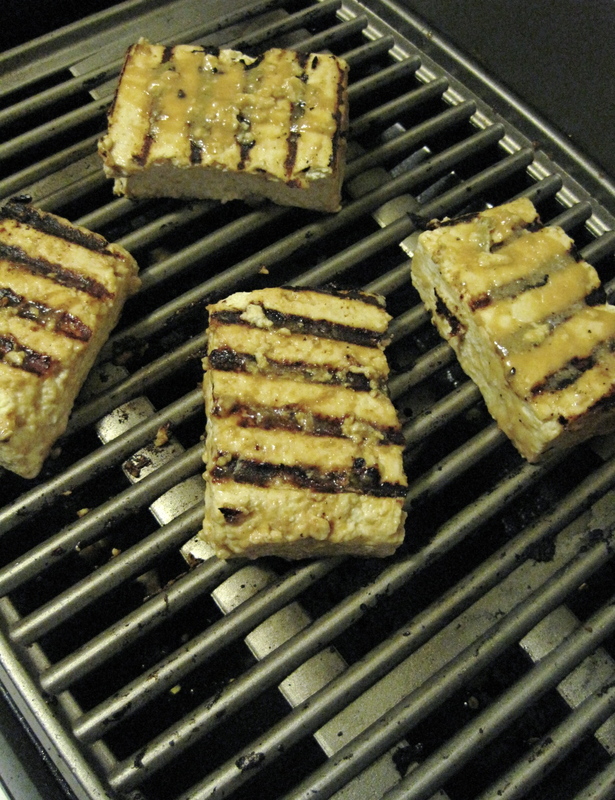 Brush grill with oil before placing tofu and vegetables on the hot grill, as they tend to stick. Avoid turning tofu and vegetables too early. Note: these measurements are approximate. Watch for the salt in miso — if you are using watery vegetables, like summer squash, the salt is necessary, but it may be a bit strong if you are only using red peppers. The saltiness is a must for tofu. Enjoy these vegetables with a dry rosé. 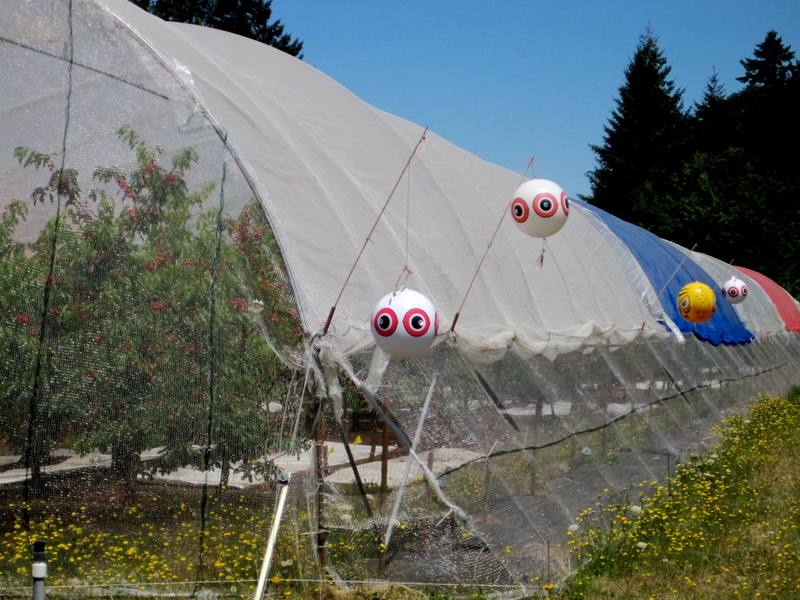 We visited mad scientists at work this weekend at the Lewis-Brown Research farm in Corvallis. Inspired by last year’s trip, when I sampled new blackberry varieties, I thought I’d see what was now in development. The cherries were in full, glorious fruit under the special experimental tents, marked by colorful balloons that mimic birds of prey. We sampled about a dozen varieties, including some fantastic cultivars that deepen the flavor and firm up the texture of Raniers. 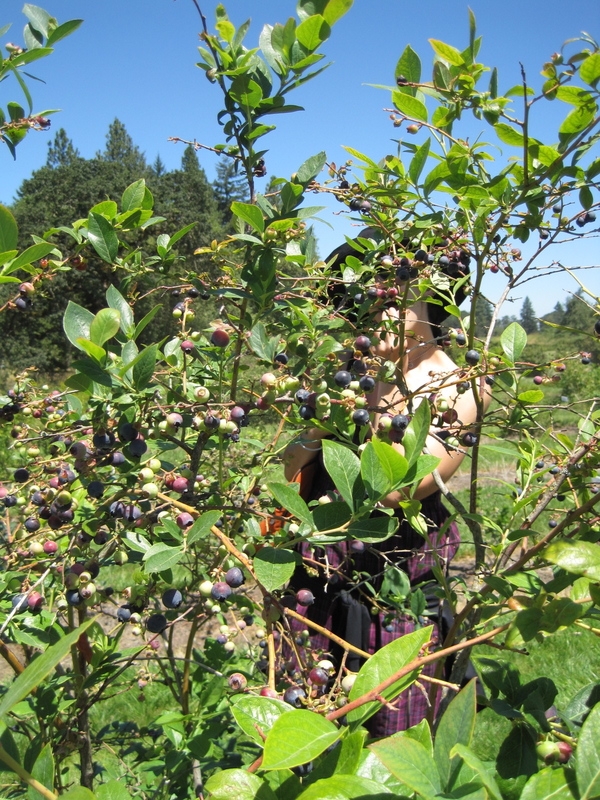 We sampled the wares at the National Clonal Germplasm Repository, or a field of blueberry specimens from all over the world. 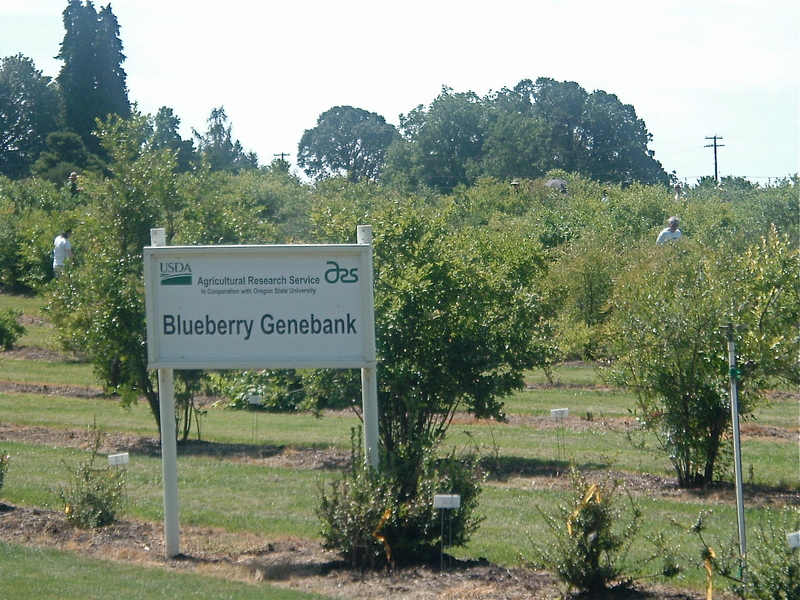 OSU and the U.S. Department of Agriculture work together to preserve the genetic material of all the blueberry cultivars they can find. It’s one of 30 seed banks around the nation set up to preserve agricultural crops and other plants. Although the high bush varieties were full and tall enough to hide my blueberry fan friend, the fruit was about 2-3 weeks late this year, and the scientists commented that they were ripening unevenly, with the extra early varieties coming in with the early varieties, and an unusual mix of ripe and unripe berries on the same branch. As you might imagine, this would cause all kinds of problems for commercial growers. At the bee station, we got to stick our hands into a box and let drones tickle us with their fuzzy, buzzy bodies. Bee expert Dr. Ramesh Sagili, who was on site in a beekeeper suit talking about hive health, was hired by OSU last year. We also talked to some of the research team working on a new pest in the Willamette Valley, spotted drosophilia, which burrows into ripening fruit and can wipe out a crop in a manner of days. We also talked to Dr. Jim Myers, the vegetable development specialist, who is now part of a research coalition that is working with different regions and farms to help improve organic farming practices. Dr. Myers was soliciting names for his purple tomatoes, a lovely aubergine color that apparently have more anti-oxidants. 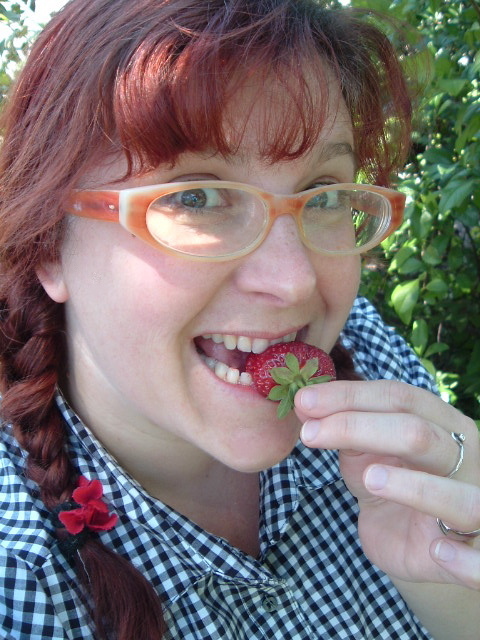 “But how do they taste,” cried one visitor. “Like a tomato,” he replied. 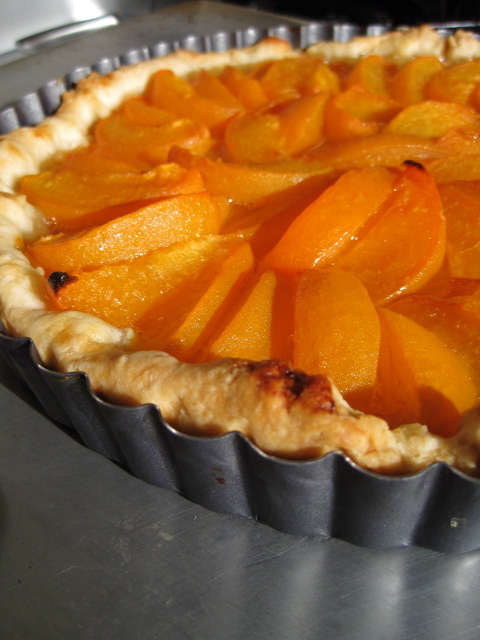 Orangette’s version of Zuni’s apricot tart. I *love* this recipe. And the crust is excellent for all pies, by the way. I substituted plain distilled vinegar, being out of cider vinegar, but I wonder if some of my fruit vinegars might be nice with, say, a blackberry pie. It would tinge the crust a pleasant mauve. I think. 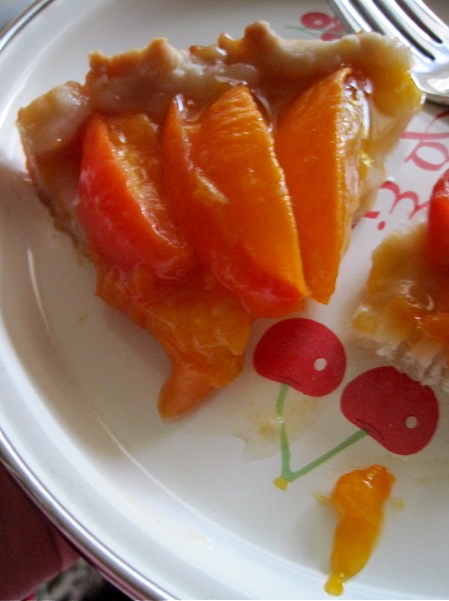 And the apricots really do soften up and lend a juicy glaze. It’s almost better to use slightly underripe ones, and don’t go more than a pound. Restraint, unbelievably, is good. 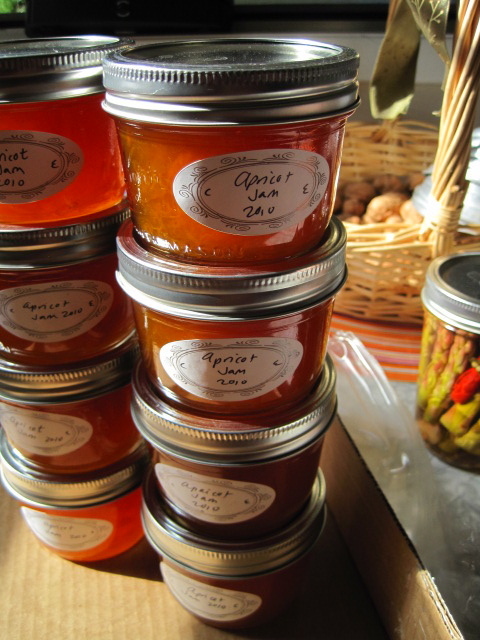 Apricot jam, two kinds. The plain jam is tart, sweet, and bursting with summery fruit. The Czech apricot is flavored with Becherovka, a cinnamon-y bitter, and a bit of cinnamon stick. Both have a shot of Hungarian palinka, an apricot brandy. 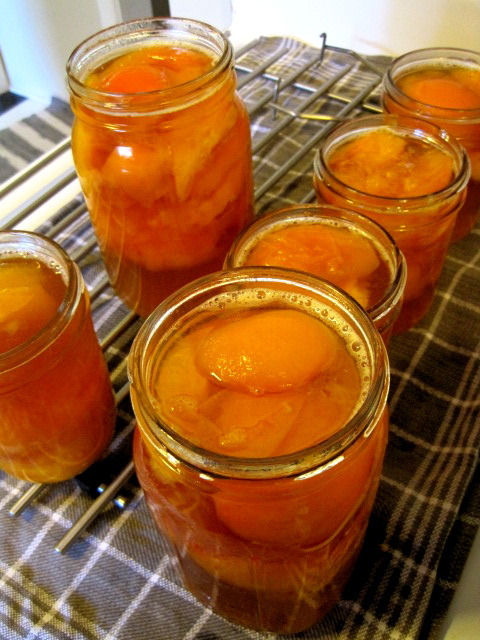 These rely on natural pectin and the softened fruit to thicken the gel. Brandied apricots. 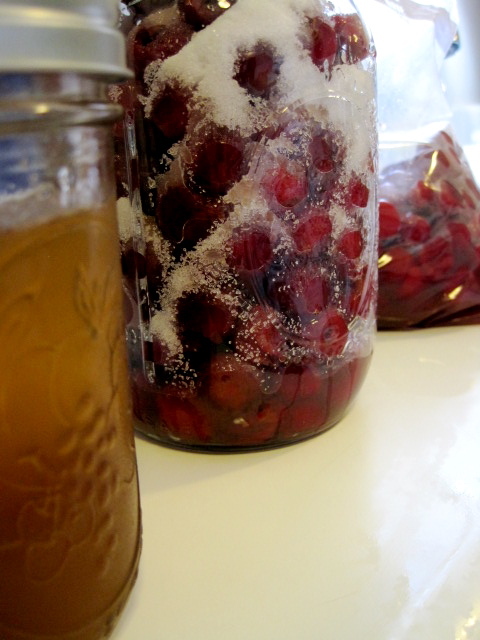 With a quick boil and sterilized jars, they’ll keep for a few months in the refrigerator. The brandy can be used for cocktails, and the apricots for ice cream or baked goods. And the leftover brandy, slightly flavored with apricot, I used for this year’s brandied sour cherries. 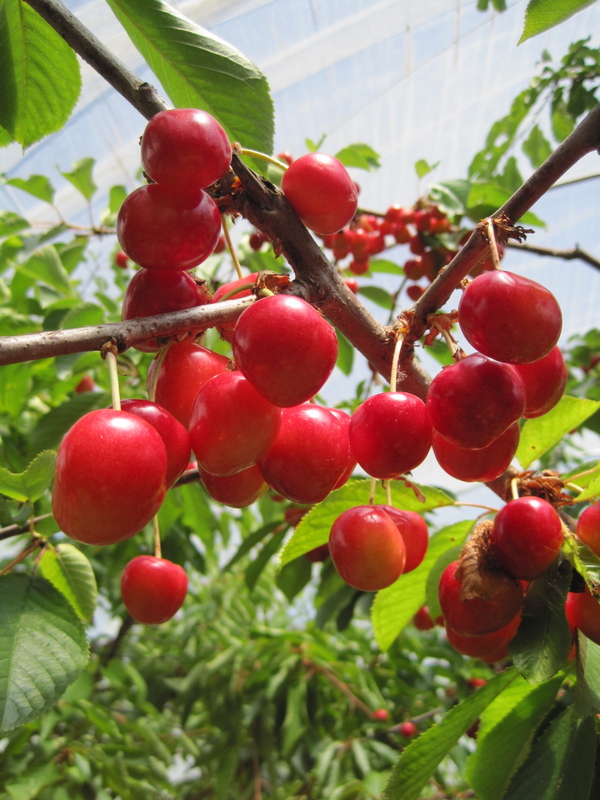 The pitted sour cherries are available for a very short window each year. I usually buy mine pitted by Hentze’s Farm in Junction City by the 5# bag. Makes life so much easier. I love the Hentze folks, and they scored some equipment when the local canneries went out of business, so you can save time by purchasing very high quality cut beans and corn, pitted cherries, and shelled nuts that they grow on the farm. They also have lugs of apricots, another ephemerally short season. If you want to make any of these treats, the time is now!